1. 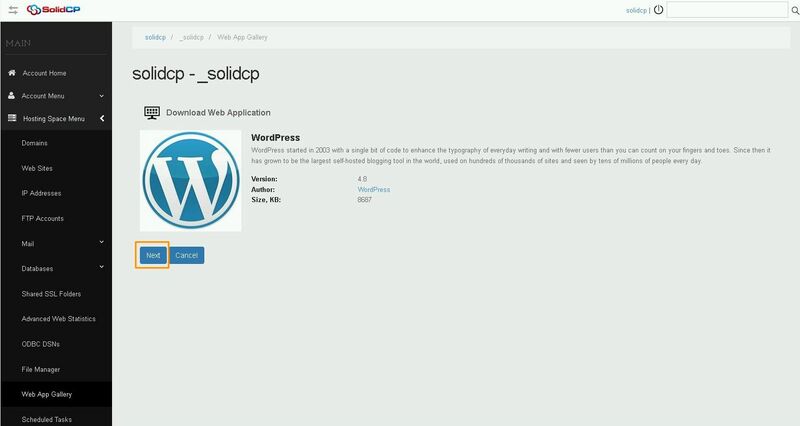 Login to the SolidCP. 2. In the next screen, you will see icons for all the services you can manage from the SolidCP. Under Databases section click on SQL Server icon. 4. Choose Database name and click Save. 6. Choose Username and Password, check the database (previously created) to add ownership and click Save. 7. 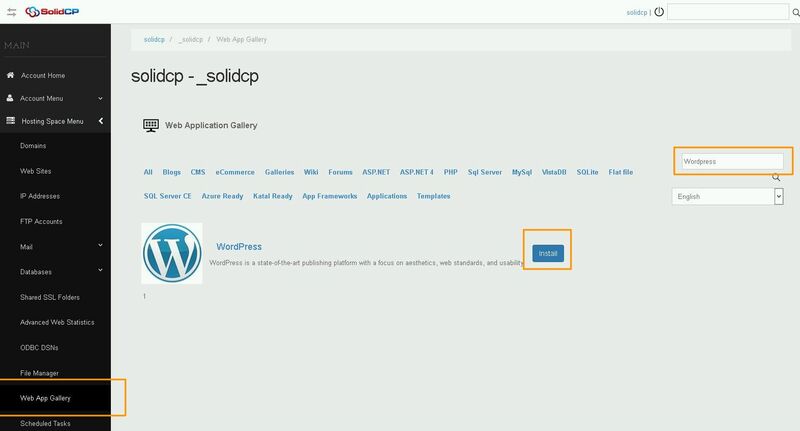 Click on Web App Gallery in the Hosting Space Menu Tab. Type Wordpress in the Search Bar click Search and choose Install. 8. On the next page click Next. Note: You may see a warning about missing dependencies, you can safely ignore this as the PHP version will be configured afterwards. Select the website from the drop-down menu where you wish to install the WordPress. This is the name of the sub-directory where the WordPress will be installed, if you wish it to remain the 'wwwroot' of the website, please leave this field blank. Choose the database you have previously created from the drop-down menu. 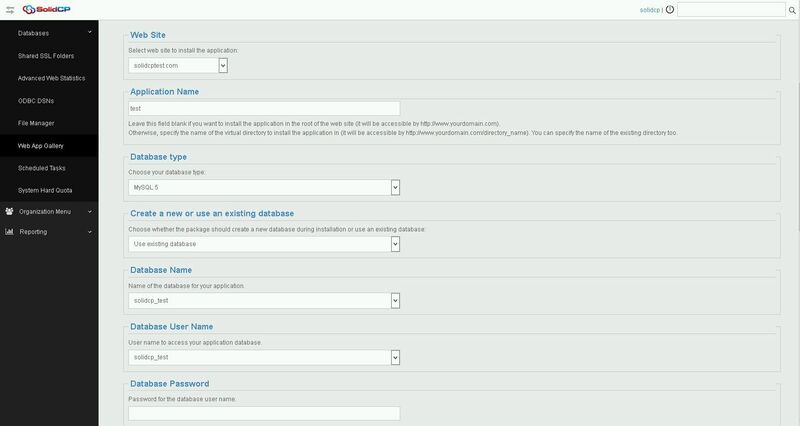 Choose the database username you have previously created from the drop-down menu. 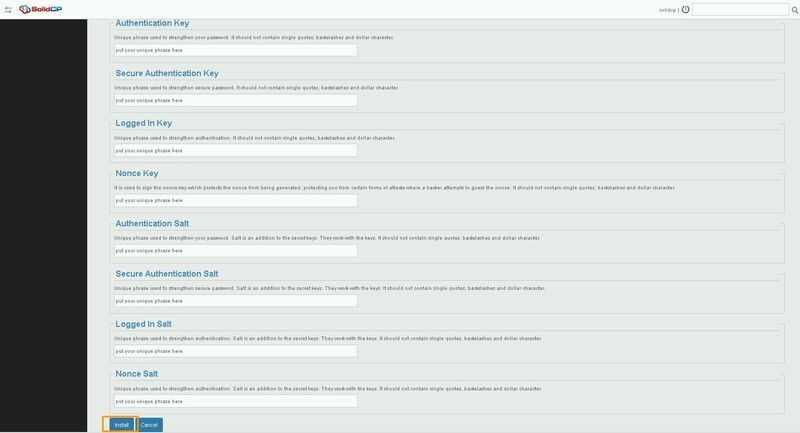 Type the password you have created for the database username. Unique phrase used to strengthen your password. It should not contain single quotes, backslashes and dollar character. Unique phrase used to strengthen secure password. It should not contain single quotes, backslashes and dollar character. Unique phrase used to strengthen authentication. It should not contain single quotes, backslashes and dollar character. It is used to sign the nonce key which protects the nonce from being generated, protecting you from certain forms of attacks where a hacker attempts to guess the nonce. It should not contain single quotes, backslashes and dollar character. Unique phrase used to strengthen your password. Salt is an addition to the secret keys. They work with the keys. It should not contain single quotes, backslashes and dollar character. Unique phrase used to strengthen secure password. Salt is an addition to the secret keys. They work with the keys. It should not contain single quotes, backslashes and dollar character. Unique phrase used to strengthen authentication. Salt is an addition to the secret keys. They work with the keys. It should not contain single quotes, backslashes and dollar character. Note: The process may take up to 5-15 minutes, please wait until the Installing Application tab doesn't disappear. 12. You will see a message "Congratulations the application has been successfully installed!" click OK to finish the installation. 13. 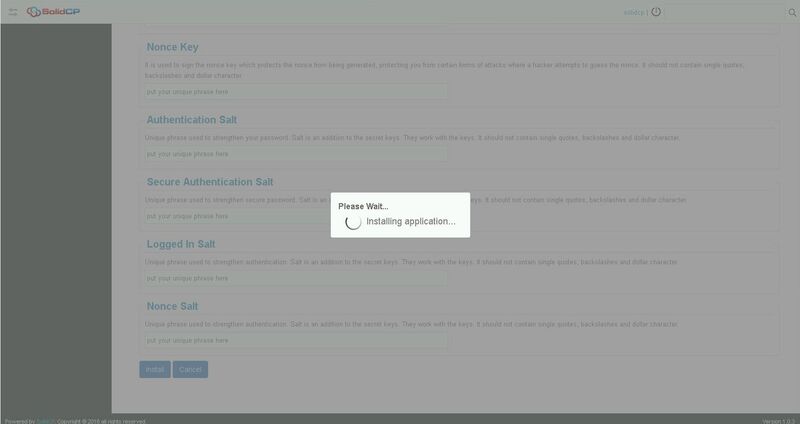 Type your website (http://domain.com) in the browser to continue managing your WordPress Application. Note: Depending on the WordPress version your PHP for the website might need to be updated to a later version, in this case please contact our CHAT OPERATOR or open a ticket to our TECHNICAL SUPPORT.